LOUISVILLE, Ky.—Bourbon enthusiasts can now enjoy cocktails during visits to the Evan Williams Bourbon Experience at its new bar, ON3. This cocktail corner adds a unique asset to the Visitor Center with cocktails and Bourbon flights available during tour hours. According to a news release, the Evan Williams Bourbon Experience allows visitors to see an operating Artisanal Distillery, where one barrel of Bourbon is distilled each day. The guided tour takes a peak into distilling on Whiskey Row from the 1890’s to the present. Now, visitors can also stop by or top off their tour experience with a cocktail at ON3. 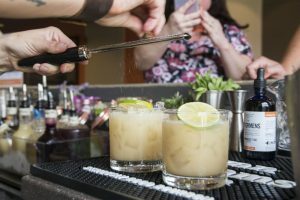 Each drink, handcrafted by mixologist Karla Plott, offers a creative twist on different Evan Williams Bourbon and Heaven Hill Distillery products. The bar is located on the third floor of the Visitor Center on Louisville’s historic Whiskey Row at 528 W Main St. The official was July 4, 2018. The bar will be operating every Thursday and Sunday from 12 p.m. to 5 p.m., and Friday and Saturday from 12:30 p.m. to 5:30 p.m.